This production opened on August 13, 2014 and closed on August 17, 2014. With pluck and positivity, Annie charms everyone she meets despite a next-to-nothing start in the Depression-era New York City of the 1930s. She is determined to find her parents, who abandoned her years ago on the doorstep of an orphanage run by the cruel, embittered Miss Hannigan. When billionaire Oliver Warbucks decides to invite an orphan to his mansion for Christmas, Annie gets her chance to experience NYC anew outside the confines of the orphanage. Despite Miss Hannigan’s evil machinations, Annie befriends President Franklin Delano Roosevelt and finds a new home alongside Warbucks, his personal secretary Grace Farrell, and a lovable mutt named Sandy. Rehearsals will be on Tuesday, Wednesday, and Thursday evenings from 6 to 9 at the Woody Lowden Recreation Center in Foster. One night for acting and singing… one singing and choreography… and one acting and choreography. Not everyone will have to be at all rehearsals until the end when we are running from scene to scene. 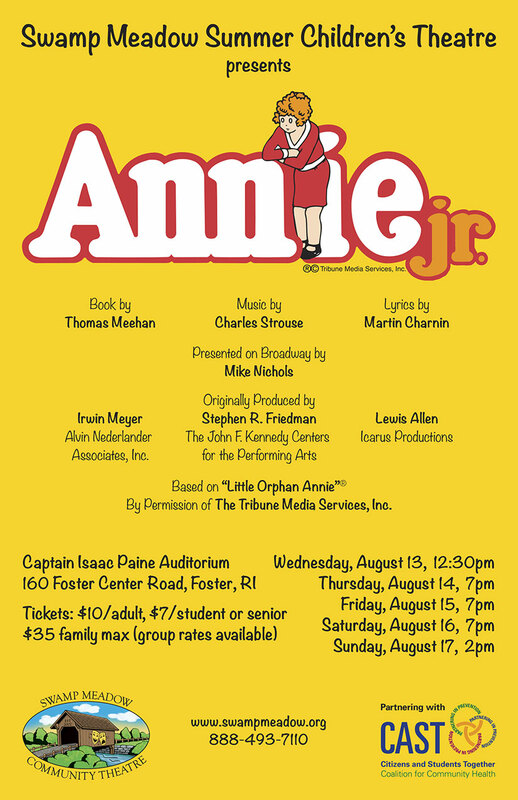 The performances will be August 13-17, 2014 at the Captain Isaac Paine School on Foster Center Road in Foster (near the corner at Route 6).